I am back! The past three weeks have been the busiest weeks I have had in a long time. I had my last weeks of class and exams, moved into a brand new apartment, and spent lots of time with dear friends who are now college alumnae. The past few weeks I wanted to focus on just being. I wanted to end the school year focused on the people around me and the tasks I had at hand. It has been nice having a little vacation from my computer and phone, but I have missed my outlet of creativity at The Coffee Table. Now that I'm back and have more free time with school being over, I am excited to be doing some new posts and hopefully some fun traveling to document, but for now, cheers to settling into a brand new apartment!! My new home is not too far from my old one, but is completely different! I am so blessed to have moved into such a nice place & I am very very excited to live somewhere with a pool. Though moving out and moving in has been a long two week process, I have finally donated loads out of my closet and have almost completely decorated my room. I love how my new room is less chaotic and hectic than my old room. I have decorated with peaceful colors, soothing textures, and cooper accents. Thanks to Copper Mug Co. I have a gorgeous way to drink some iced coffee for the summertime! I love the brightness these copper pieces have brought into my kitchen and room! These pieces are not only beautiful, but also very affordable if you are looking for some nice glasses to serve your guests or just a nice little treat to make your day feel special! Here are the two pieces featured in this post & pictured below! I love that in my new apartment I have a little corner nook right by the window to sit in the mornings and do my devotions, read the Bible, and sip my coffee. If you struggle to read God's work routinely, it really helps to have a designated spot in your home or place you like to visit to be your designated quiet time spot. Having a pretty & calm space to do my reading, motivates me and helps me to focus. Also loving this Raleigh coordinates pillow I bought from All That Sparkles Shop. I wanted my room to embody myself so I chose this pillow because it is locally made and displays my love for the city of Raleigh! Make sure to check out this local business! I hope to share more of my new place once I get more settled! 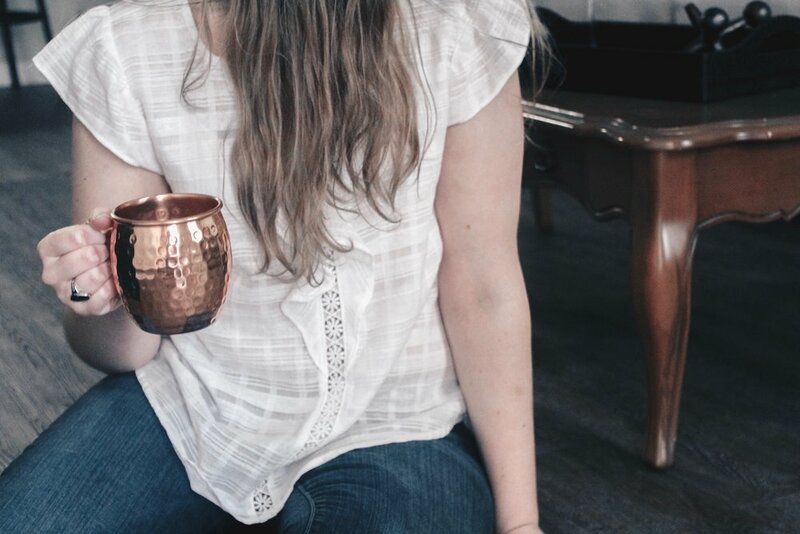 Be sure to check out Copper Mug Co. and their lovely pieces! And happy summertime!! Thanks for joining me today at The Coffee Table.